Muslims scientists and engineers have enriched America. This is a story that needs to be told, and told loud and clear so that future generations are inspired to excel in their fields and serve humankind. This article is about the NASA Hubble Space Telescope. As Senior Staff Project Manager at Perkin Elmer Corporation in Danbury, CT, I had the privilege of being a member of the core team that designed, built, assembled, tested and delivered the Hubble. I was responsible for delivering diffraction limited performance for the Secondary Mirror Assembly at 1/700th of a wavelength of light in the visible (0.63 micrometers). It included the Metering Truss, the Secondary Mirror and its Strain Free Mount, the stray light Baffles, Figure Control Actuators, the Advanced Composite Structures as well the Zero Gravity Float. Each one of these was a research project in itself that stretched the limits of technology. The lessons learned were later used in advanced systems both in the civilian and other sectors. This is a brief non-technical note on that exciting project although some technical jargon is unavoidable while discussing such a highly specialized subject. The illustrative pictures are from open source. The Hubble was one of the most precise instruments built in the twentieth century. It expanded the horizons of humankind and provided deep insights into the universe that we are a part of. Specifically, it enabled us to know with greater certainty the location of black holes at the centers of galaxies, improved the precision of the time of origin of our universe, enabled us to witness stars of magnitude 8 (formed as early as a hundred million years after the Big Bang) and provided us pictures of distant stars and galaxies with awe inspiring resolution. Astronomical observations depend on the signal to noise ratio (SNR). The higher the signal to noise ratio, the greater is the resolution (clarity) with which we can see the stars and galaxies. The electromagnetic waves from the stars and deep space objects constitute the signal. All else is noise. The stray light from earth and from the atmosphere are sources of noise that reduce the SNR. Space based telescopes are free from earth bound noise and offer ideal platforms for astronomical observations with a high SNR. The proposal for a space telescope was advanced as early as the 1950s by the physicist Lyman Spitzer (1914-1997) and others. In the 1970s, when the American space program was at its zenith, the US Congress allocated the funds to conceptualize and build the Hubble (named after the astrophysicist Edwin Hubble). The thrust was the advent of the Space Shuttle which offered new means of deployment of payloads like the Hubble. 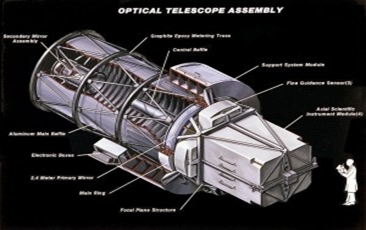 The core of the Hubble is the Optical Telescope Assembly (OTA) with which I was associated. The optics is a Ritchey–Chrétien reflector (invented as early as 1910). Light from far field (deep in space) is collected by a convex primary mirror which reflects it onto a concave secondary mirror. The reflection from the secondary mirror passes through a hole in the primary mirror and is “seen” by a focal plane located at the focus of the secondary mirror. Light shields are used on both mirrors to minimize stray radiation. The primary mirror of the Hubble is 2.4 meters in diameter. Why? This size is dictated by the size of the bay in the Space Shuttle which carried the telescope into space. The primary mirror is ground to 1/70th of a wavelength of red light (0.63 micrometer). The secondary mirror is 14 inches in diameter and is ground to 1/700th of a wavelength of red light. Why? The precision of the mirrors is dictated by the wavelength of operation which is chosen depending on mission requirements. In general, you can tell a great deal about a telescope or a sensor just from the wavelength of its operation. The long wave infrared telescopes are used for surveillance and tracking. The short wave infrared telescopes are used for homing devices and missiles. The visible and ultraviolent telescopes are used for celestial observations. The shorter the wavelength, the greater the precision of the mirrors and the greater the stress on design. The other reason is cost. The greater the precision, the higher the cost. The mirrors of the Hubble are ground to operate from 0.35 to 0.75 micrometers. In other words, they operate in the ultraviolet to the short wave infrared spectrum. The performance of a space telescope is limited by the diffraction of space particles. As a rule of thumb, diffraction limited performance is about 1/18th of the selected wavelength. Each of the components of a telescope contributes an “error” (inaccuracy) because of the limits with which it can be designed, manufactured and assembled. In the Hubble, all the “errors” from all the components statistically add up to less than 1/18th of a wavelength of red light. Management of the “error budget” is a major challenge in a complex project such as this as it runs across conceptualization, systems definition and analysis, design, manufacture, assembly, test and post-launch operations. The next challenge is to grind the mirror so that it has the desired shape in the weightlessness of space. When you polish a mirror on earth, it will “sag” due to gravity. This sag has to be corrected so that the mirror has the correct shape after launch in space where there is no gravity. The construction of a zero gravity float was one of the responsibilities of my group. An ultra-precise mechanism was designed to “float” the mirror and achieve zero gravity on earth. The 1800 pound hogged out (lightened) fused silica mirror was conceptually divided into 132 segments and the weight of each of these segments was precisely calculated using finite element structural analysis. An ultra-fine balance was built to apply an upward thrust on each individual segment, precisely equal to the calculated weight of that segment. It was a major achievement to so balance the large mirror and attain zero gravity on earth. The Optical Telescope Assembly of the Hubble is divided into four major subsystems: The Primary Mirror Assembly, the Secondary Mirror Assembly, the Focal Plane Assembly and the Fine Guidance Sensor. All of these systems are supported on the Main Ring, a doughnut shaped titanium structure. Let me tell you a story here. The Main Ring was manufactured in Upstate New York and was shipped to Danbury, Connecticut, a distance of about two hundred miles. This kind of specialized hardware is specially packed and sealed in air bags to prevent damage in transportation. On the way, the truck carrying the Main Ring ran into severe rain storms and had to pull out of the highway. Accelerometers attached to the truck showed 5g loads, meaning the trucker had hit big pits on the off ramp. In any case, the truck arrived at our facility in the early hours of the morning and I was one of the team asked to receive it. When we opened the truck door, water came gushing out of the truck and with it there was a little frog. To this day I do not know if the frog was inside the truck or came from the outside! In any case, the Main Ring had to be vacuum baked at 220 degrees F for several days to dry it out. Good thing it was built of Titanium. If it was any other material, the 8 million dollar item would have to be scrapped. The lessons for scientists are obvious: No matter how careful you are, you cannot avoid the intrusion of nature (the Divine Laws) or the frivolities of human behavior. The Primary Mirror, Secondary Mirror, Focal Plane and the Fine Guidance Sensor have to be kept in a stable configuration with respect to one another. Thermal fluctuations (the heat and cold of space) and launch dislocations can change the distance of one component from another. Weight, stiffness and stability are major drivers. On the Hubble, each pound of extra weight added fifty thousand dollars in launch costs at 1980 prices. A tubular Metering Truss, built of graphite epoxy advanced composites is used to keep the two mirrors in fixed configuration (distance and tilt) with each other. The advantage of composites is that you can “build” these materials unlike the naturally occurring materials such as metals. High strength GY 300 fibers with tensile strength in excess of 300,000 psi were used on the Hubble. The composites were designed to have high stiffness ratio, high specific strength and very low coefficient of thermal expansion. 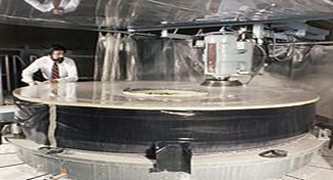 The measurements required for the characterization of these innovative materials were so small (10 E-7 ins/in) that they exceeded the capability of interferometers then available and required the invention of novel methods of measurement. The advanced composite tubes were fabricated at Boeing Aircraft Company in Seattle. Do not be so awed by these fascinating new materials. A visit to fabrication facilities in one of these big name companies reminds one of grandma’s kitchen. Their fabrication is still more of an art than a science. Defects in manufacture are commonplace and have to be patched up or they have to go through a Materials Review Board for acceptance. The Hubble advanced the state of the art in advanced composites. The lessons learned about the limits of composite material usage under various load conditions, their stability when subject to temperature variations, moisture (water and volatile condensable matter) and the environment, were used in other advanced systems in later years. The mounting of the mirrors without distorting their fine shape is a specialized research issue. The Secondary Mirror, for instance, which is ground to 1/700th of a wavelength of light is so sensitive that it changes its shape when a person walks into the room in which it is kept, due to the breathing of the person. The strain free mounting of the Secondary Mirror was entirely my contribution which resulted in awards of multiple US patents. The Focal Plane Structure houses the bays for the Scientific Instruments (SI). It is built of advanced composites, except for the ”feet” that interface with the Main Ring, which are built of Titanium. This was done because the advanced composites were found to be inadequate in compression and flexure (bending). The Hubble was designed “inside out” so that the Scientific Instruments could be serviced or removed and new ones inserted by astronauts visiting it on the Space Shuttle. A similar “inside out” design was later used on the Solar Optical Telescope (SOT). A variety of Scientific Instruments were used on the Hubble designed by American, European as well as other national agencies. Each had its own focal plane arrays and detector cooling means, if any. The Wide Field of View Camera, Near Infrared Camera and various spectrometers are well known examples. The awesome pictures of the heavens that we see on the web were taken by these Scientific Instruments and then transmitted to earth via telemetry. The Fine Guidance Sensor on the Hubble used triangulation on known stars to fix direction (“And He it is who created the stars so that you use them to navigate in the depths of darkness on land and in the oceans (of water or space). Behold! We have described in detail Our Signs for a people who have knowledge.” Qur’an 6:97). Solar panels were used to generate the 2800 watt power required of the telescope. While the systems, conceptualization and design are challenging tasks, manufacturing and assembly are even more challenging. This is because most of the “error budgets” are consumed in the structural joints. You can have the most perfect design and superb individual components but if the assembly is sloppy, all you will have is a sloppy instrument. The assembly is done in class I clean environment, cleaner than the cleanliness in the best surgical wards in top notch hospitals. Access is restricted. Testing is conducted as each assembly is complete to ensure that the “error budget” allocated to that assembly is not exceeded. Even with all the care in the conceptualization, design, assembly and testing, when the Hubble was launched in 1990, and the first images came back from space, they were fuzzy. That meant that the big mirror was flawed. What happened? The interferometer used to measure the final shape of the Primary Mirror was itself flawed. A final test on the Mirror would have shown this error before assembly and launch. However, by the time the Hubble was completed, it had significantly overrun its budget. 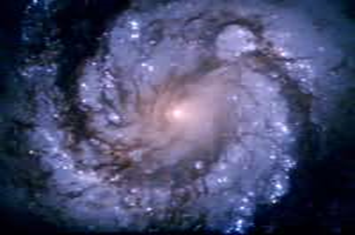 The initial estimate for the Hubble was 225 million (1975) dollars. By 1983 the costs had exceeded 1.25 billion dollars. An alarmed Congress refused to allocate additional funding for the final test. Fortunately, the error (it is called a low frequency error as opposed to patchy blotches that appear in isolated spots on the mirrors which are high frequency errors) can be corrected in the scientific instruments (SI) by inserting a corrective lens train and modifying the Optical Path Distance (OPD). Here are more lessons for scientists and engineers: be humble and never be too sure about you have done until you have empirically measured and satisfied yourself that what you done is correct. The Hubble expanded the horizons of humankind and enabled it see the very edge of known universe. The awesome pictures of our universe have gone a long way towards understanding who we are and how we got here. There were many who questioned the wisdom of spending so much money on a single instrument. I remember a conversation with Paul Brickmeier, one of the Senior Program Managers on the Hubble, when we were both visiting Boeing in Seattle in connection with advanced composites work. Paul was not sure if the cost was worth the effort and if the money could be better spent on more worthy social projects. I still remember what I told him: “One day the story of America will be written. In that story the Hubble Space Telescope will be written as one of America’s finest hours.” Indeed, it was one of the finest hours for humankind and I am happy as an American Muslim that I played a key role in it. Prof. Dr. Nazeer Ahmed was a Senior Staff Project Manager on the NASA Hubble Optical Telescope Assembly from 1979-1982.